Nature is the best Engineer ... We learn from Nature. Through the engineering accomplishments of the past, the world has become smaller, more inclusive, and more connected. Knowledge is new Money ... Engineers make a world of difference. Engineering is about innovation and creativity - developing novel solutions for a sustainable world. They innovate solutions making our lives better. Engineers are problem solvers. Every challenge has a solution in the engineer’s world. Be an engineer where you have a chance to improve the world. - Global Connections :: Collaborate and learn first hand from instructors with global exposure. - Imagination :: Given the opportunity to create without limits, what kind of world would kids create? I am happy to inform you all that I received admission in University of Texas, Arlington – USA for MS program (Masters in Civil Engineering). I am writing this email to say “THANK YOU” to entire AIT staff. Past four years in AIT was the crucial time of my life. As an institution, AIT helped me to find my potential. I will always be grateful to my professors in AIT; the lectures from the experienced staff nurtured and motivated me to explore various fields in Civil Engineering. During my admission process for Master’s program, my AIT professors supported and guided me wholeheartedly. It was their encouraging words that gave me confidence to face many challenges during the complex admission process. In this competitive world, mere knowledge from books is insufficient. That’s where, I find my college special. In AIT we had the freedom and ecosystem of faculties which facilitate a great learning environment. Along with academics, we had opportunity to develop our extra-curricular talents as well, which immensely helped me to develop my leadership, management and communication skills. Once again “Thank You” AIT. AIT follows the student centric approach in education, where freedom to think, innovate and lead is emphasized. Professional freedom to think, innovate and lead makes employees dependable, trustworthy, and good at their jobs which is what innovative enterprises / companies look for in employees. At AIT, we impart practical skills and accustom students to the industrial requirements through a number of activities by professionals from industry within India and abroad. AIT Palakkad is positioned to facilitate the process of learning (rather than teaching). We encourage in-house student projects relevant to industry, healthcare and social well-being (avoiding over engineering solutions), and other social issues. Emphasis on research, innovation and entrepreneurship are encouraged in student projects. Final year student projects play a crucial role in interviews. Ionic3DP Singapore and IEEE Student branch, AIT Palakkad. This workshop empowers students to learn process of design thinking and working in groups. 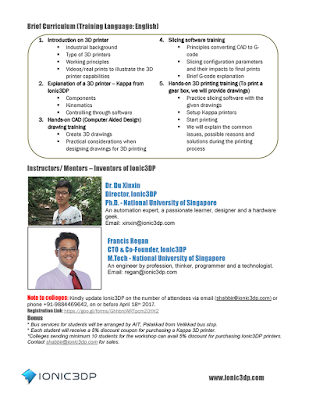 There will be hands-on workshop in designing, 3d printing as well as robotics. This workshop will be conducted by highly trained and reputed instructors from Singapore, who will guide the students on proven techniques and concepts. Design thinking is an art that enables students/inventors/ artists to think beyond the problem statement and take a step-by-step approach to derive a solution. Design thinking draws upon logic, imagination, intuition, and systemic reasoning, to explore possibilities and to create desired outcomes to the problem statement. Design Thinking introduces a new way of thinking about the problems and questions we face in our world. It steps outside of the traditional boxes with visual thinking, creativity and innovation in order to find new solutions to the same old issues. Dr. Du Xinxin (Ionic3DP and National University of Singapore), An automation expert, a passionate learner, designer and a hardware geek. Francis Regan (Ionic3DP and National University of Singapore), An engineer by profession, thinker, programmer and a technologist. 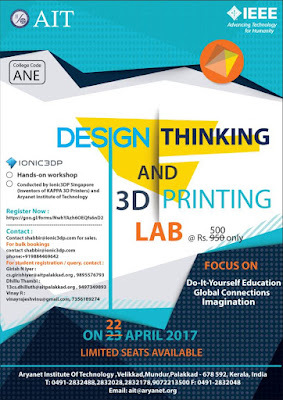 To register, Email to (shabbir@ionic3dp.com) or phone to +91-9884469642, on or before April 18th 2017. I am writing this mail to inform my happiness and gratitude to the entire Aryanet family. 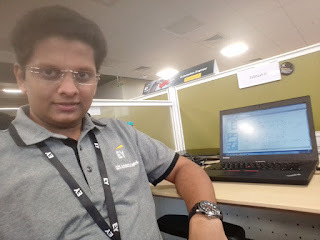 I have got placed in EY Trivandrum as an Associate Automation Engineer in Robotics Process Automation. 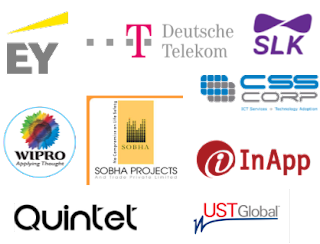 EY is one of the best four among companies in the globe. I feel immense proud and glad to start my career from such a big firm. Of course, all the credits of my gladness goes to the entire family of AIT. Now, I'm having nostalgic feelings of my campus life. 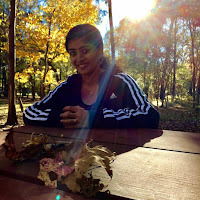 I remember the freedom, guidance, happiness that all I experienced from my college. My campus gave me the opportunity to evolve myself against the growing competition. My teachers gave life to my thoughts and actions. Literally, my college especially my CSE department was a family. AIT Palakkad receives Certificate of Appreciation from AICTE AIT Palakkad receives appreciation award from Dr. MP Poonia, Vice Chairman, AICTE for having associated with Saansad Aadarsh Gram Yojana (SAGY) Project launched by Govt of India.